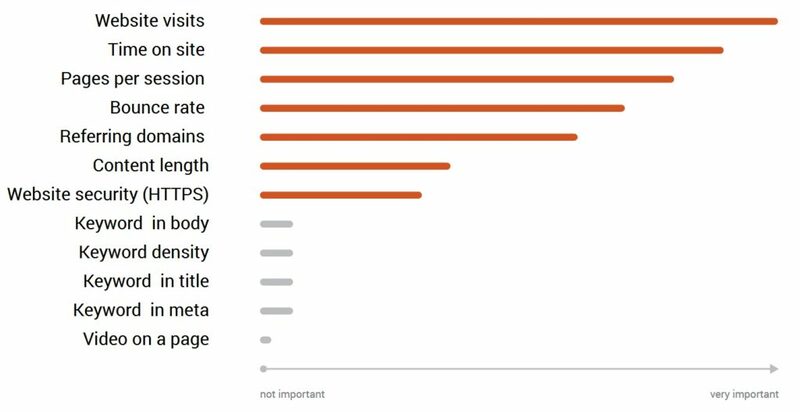 We like to keep a close eye on any research related to ranking factors, and SEMRush’s ranking factors report has given us plenty to chew over since its release last week. 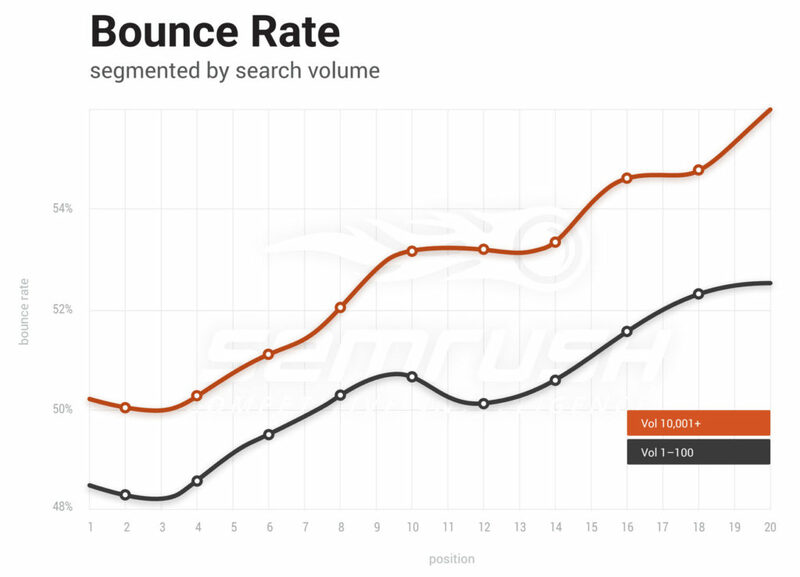 To create their report, SEMRush has combined close to 600,000+ keywords in the top 100 positions and split them by both the keyword volume and keyword length. They’ve then gone a step further and used machine learning algorithms to help determine the overall importance of the different factors, and the results are very interesting. If you want to know what’s affecting their rankings today, but don’t have time to read the full report, do not fear, we’ve put together a summary of some of the most important points, along with tips on what to do with the findings for your own work. 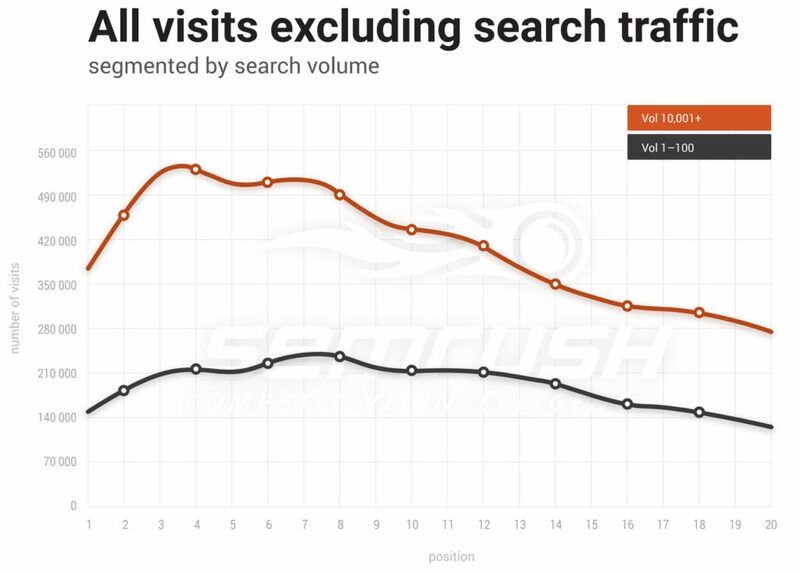 Perhaps the most surprising of these results is the weighting of importance toward website visits, and the lack of importance given to the more obvious SEO ranking factors involving keywords and how it is used in content. Read on, and you’ll begin to see why this is the case, however, it is worth mentioning at this point that the above findings are NOT saying that use of Keywords aren’t important, but rather the study revealed they’re just less important than other factors. Here’s a breakdown of their findings by section, along with key takeouts. 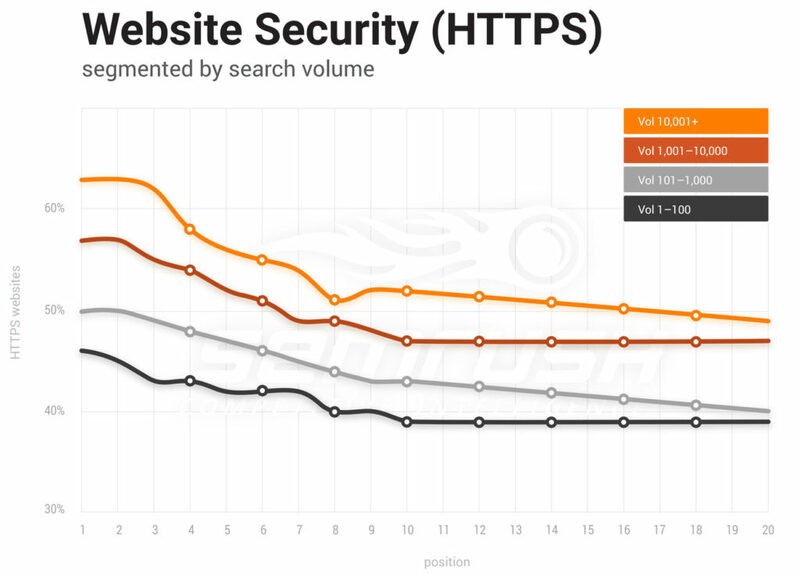 The higher the search position the more pages are using HTTPS – this is a little chicken and egg as sites that are already well optimised are likely to have switched to HTTPS anyway. However, the trend is the same across all types of keyword volume but there are fewer sites using HTTPS that rank for lower volume keywords at present. Insight: If you’re trying to rank for lower volume terms, HTTPS could be a deciding factor in boosting your rankings. For high volume terms, if you’re not using HTTPS, you might be the only one! However, overall the impact of HTTPS on rankings appears to be quite small. Overall the data shows that the pages ranking in the top positions have more backlinks from unique domains. A site ranking for high volume keywords has almost 10x the number of unique domains pointing to them as a site ranking for lower volume keywords, indicating that the more competitive the keyword, the more backlinks that are required to rank in the top positions. 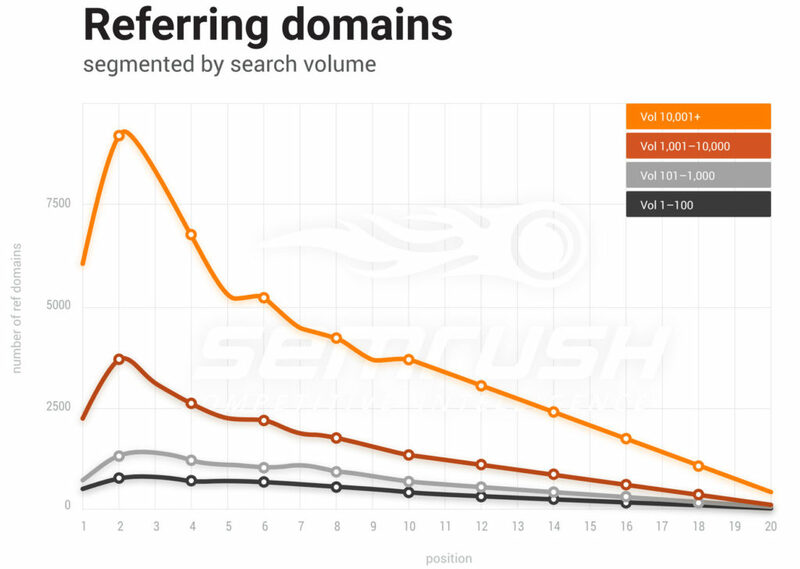 This is especially pronounced for the top 5 rankings where there’s a big spike in the number of unique domains each page has. Insight: Backlinks are still very important. For lower volume/less competitive keywords, backlink work can bring about some real results – the bad news is if you’re competing on really high volume keywords, the median number of unique domains was 10,000, so competition is very tough! Generally speaking the pages ranking in the top positions, are also those with the longer content length. 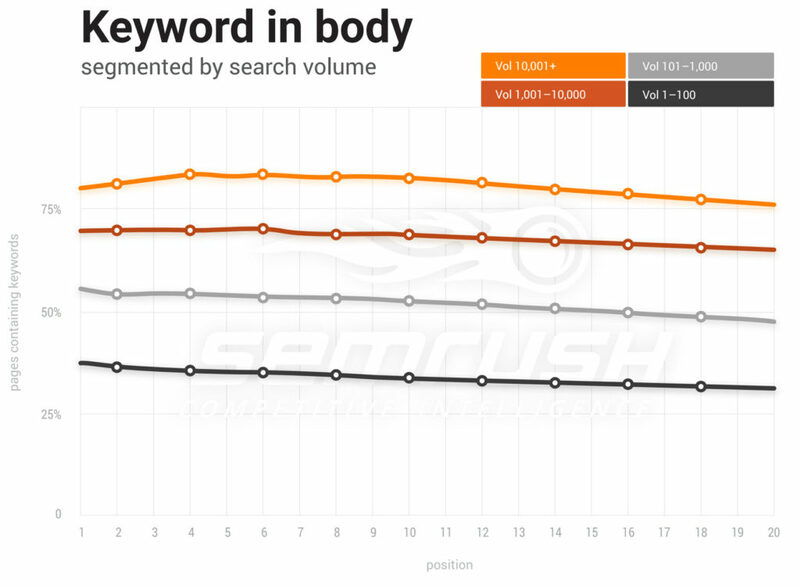 The larger the keyword volume, the longer the piece of content is that ranks in position 1, and the median length of high volume keywords is about 1.5x that of lower volume keywords. Insight: Content length isn’t an automatic SEO win; it still needs to be well-written, valuable and optimised. It makes sense that if you’re writing content for high volume terms, you’re likely writing about broader topics and therefore have more to say, resulting in longer content. For keywords in the page title and meta description, the trend curve is pretty flat across all volumes and positions, meaning that whether in position 1 or 20, the same % of sites are using keywords in titles/meta description. However, for high volume keywords, less than 50% of sites in any position are using keywords in their meta descriptions, and for low volume keywords, only 15% are using it in their meta description. In terms of keyword usage on page, short head terms are used more frequently on high ranking pages than on their long-tail counterparts (which makes sense as it can be more unnatural to use long-tail keywords more than a few times, and Google still understands 1 or 2 mentions enough to rank pages effectively), whilst for both short & long-tail the pages ranking in #1 have more mentions of keywords than other positions. Insight: For high volume terms, using keywords in title and body is the norm, but for low volume terms the % of keyword usage on pages is a lot lower. For longer-tail keywords, having exact match instances of it on your pages is less important, instead the use of a variety of topic terms and semantically similar terms seems to be more important. The data SEMRush uses for this is 3-fold – the number of unique visits per month, the total number of visits per month, and the total number of non-unique visits excluding organic search. The results are interesting, showing both that pages in a higher position receive more visits, but that even with organic search traffic excluded, the trend is the same, with pages in the top positions receive far more traffic than those in lower positions. Insight: This data backs up a popular school of thought, that the size of a brand and its footprint across the web is becoming a more important factor to Google over time. Consider it like this, any site can buy links, any site can upload lots of content, but not any site can (easily or quickly) drive significant brand searches and direct visits… the size of a brand and the authority they hold isn’t an easy thing to game and takes a lot of effort to build up over time, therefore becoming a useful metric for Google to judge sites by when determining where they should rank in the SERPs. Moz performed some research on this ‘halo effect’ and their results showed that increased brand search did positively impact rankings, albeit temporarily in their test. The data for this includes Bounce Rate, Time on Site and Pages per session. The data showed that sites in #1 have a bounce rate of around 49%, compared to an average of about 52% for pages in position #10, whilst time on site for sites in position #1 is close to 4 minutes, and 3.5 minutes for position #10. Average pages per session for position #1 sites is 3.30, whilst for pages in #10, this drops to around 3.10. Insight: On the surface, the pages ranking in higher positions have much better user behaviour signals. This might be down to better content and experience but also likely down to general trust and people engaging with bigger, well-known brands who also rank well (see point above). However, the data is what it is, and on the face of it, it definitely pays to ensure your on-site experience and related metrics are as positive as they can be. Interesting results, but what do they change? The report certainly throws up some interesting insights, particularly around visits and the possibility of Google widening its net outside of the immediate organic search space in determining the authority of a site and whether it should be ranking in the higher organic positions. Overall though, the results of this report shouldn’t come as too much of a surprise. We know that ultimately Google wants to be serving users with relevant, useful and valuable content for every query, and the above factors in the right measures, all go towards ensuring a page or piece of content does it’s best to serve that need. Perhaps the most important insight to take then is that becoming siloed or single minded with your marketing efforts is a surefire way to leave areas neglected, and for your overall brand to suffer. Instead focus on all aspects of marketing to help drive visibility, trust, authority and ultimately success. If you’ve finished reading this article and feel like you could do with a little extra help on your marketing strategy, get in touch, we’d love to help.